Spirulina is a proteinrich, blue-green algae well known for its cleansing and detoxifying effects. Soaring Free Superfoods? spirulina is grown and processed under the strictest quality control standards and is free from pesticides, herbicides, preservatives, GMO’s and additives. Spirulina has the highest protein content of any food, and is packed with B vitamins for higher energy levels. Spirulina is a pre-historic primordial original food. This 3,5 billion-year-old organism has emerged as one of the most spectacular foods on earth, because of its remarkable ability to convert sun energy into chlorophyll-rich protein. 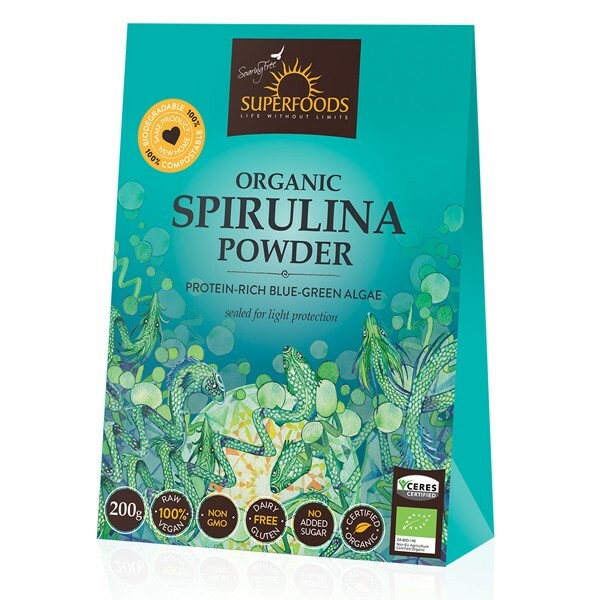 Spirulina is a proteinrich, blue-green algae well known for its cleansing and detoxifying effects. Soaring Free Superfoods? spirulina is grown and processed under the strictest quality control standards and is free from pesticides, herbicides, preservatives, GMO’s and additives. Spirulina powder has a unique, strong, salty taste. Blend into fresh juice or smoothies. It combines well with citrus fruits such as pineapple, orange, lemon as well as mint. Start with 3g daily, (level teaspoon) and gradually build up to a recommended daily dose of 10g for overall health maintenance.